You may have noticed that I haven’t updated this site in three months. Ever since I began regularly reviewing movies almost 10 years ago, I have never fallen as far behind on my duties as I have this summer. My excuses are all valid: full-time job, the demands of the P90X workout, editing my novel, etc., but I admit that they’re still excuses. At the end of the day, I have the same amount of time at my disposal that Thomas Jefferson had. Bridesmaids is a solid raunch-comedy. Co-written by the film’s star, Kristin Wiig, this movie was billed as the female equivalent of The Hangover, and that’s a fair assessment. It certainly showed that women can keep up with men as far as shameful behavior goes, and a few truly hilarious bits lifted this comedy above much of the competition. There are still some all-too-familiar gags I could have done without (including some token bodily function jokes, which I’ve never thought were funny), but overall, Bridesmaids strikes a winning balance of heart and low-brow humor. I wrote in my 2004 review of The Incredibles: “Some day, Pixar’s going to make a movie that’s simply ‘good,’ and it’s going to be a huge disappointment.” Fast forward seven years, and here we are. Cars 2 isn’t a horrible movie in its own right, but it falls far short of Pixar’s own standards. Cars and Cars 2 are Pixar’s weakest pictures in my opinion; the story and characters of Cars just never quite worked for me, and Cars 2 lacks even the heart and freshness of its predecessor. The result is a forgettable and unnecessary sequel, though judging by early previews, Pixar seems to be back on the right track with Brave, its newest film slated for a 2012 release (incidentally, Brave will also be Pixar’s first fairy tale). Cowboys and Aliens delivers exactly what it promises, though I hoped for a little more. Daniel Craig and Harrison Ford star in this wild west picture with a twist: an invasion from outer space. The goofy premise clashes with the film’s dark tone at times. Cowboys and Aliens takes itself a bit too seriously, which keeps it from being as fun as it could have been. I know the filmmakers were bound by a graphic novel as source material, but as far as tone, a different mix of suspense, adventure and humor would have made for a more enjoyable picture (I’m thinking of movies like the original Pirates of the Caribbean). Still, Cowboys and Aliens has some strong moments, and Craig and Ford make such good cowboys that I found myself wishing I was watching a traditional western. Crazy, Stupid, Love was the biggest surprise of the summer for me. The trailers didn’t inspire too much confidence, but I fell for the film’s writing and quirky charm right off. Finally, here’s a romantic comedy with brains behind it. The actors are solid all around (including the child actors, who play the maturity fluctuations of their ages very well), but the clever writing stands out the most. Romantic comedies so frequently fall back on stock characters, familiar stories, and predictable plots, but Crazy, Stupid, Love brings freshness even to its cheesiest and most formulaic moments. The screenplay deftly navigates the dangerous romantic comedy waters by respecting its characters and its audience. 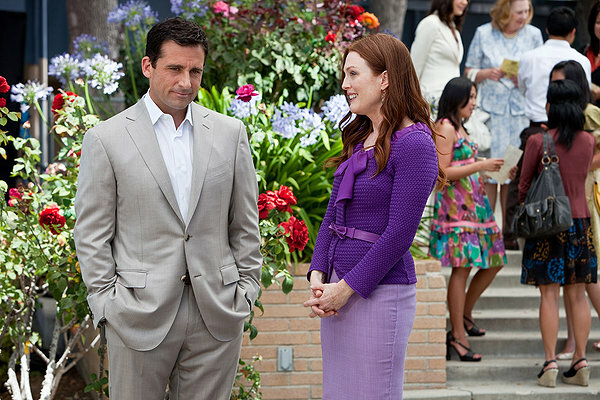 Steve Carrell and Emma Stone give particularly enjoyable performances. If you passed on Crazy, Stupid, Love (as I almost did), do yourself a favor and catch it on video. As a big fan of the Harry Potter novels and films, I was very pleased with how the franchise bowed out. The acting and action are top-notch, and the fast pace balances HP 7: Part 1 perfectly. Looking back, the series and its stars matured gracefully over a ten year period, and the child actors gave their all at the end. Alan Rickman stands out yet again as Severus Snape, arguably stealing the show in his crucial backstory sequence. I have a few qualms with the film’s ending, especially with some of the changes made to the final battle that robbed the showdown of its full potential, but the final epilogue is charming and truly magical for fans. As far as book-to-screen adaptations go, Harry Potter resides in the upper tier. On Stranger Tides, or Pirates 4 as I call it, is merely the latest example of an old Hollywood problem academics refer to as “not knowing when to stop” (most films with the number “4” attached to their titles apply here). The characters and charm of old have all grown stale, and the plot (or lack thereof) failed to draw me in. I hoped that this picture might redeem the disappointments of Pirates 3, but it ultimately reinforced what I already believed: the Pirate writers never fully understood what they had. They penned an average first film which the actors then elevated to a higher plane; the writers then wrote a good sequel which was really just a setup for a grand finale, and then those same writers blew it with a dark mess of a third film that dragged the fun down to the depths faster than you could say “Davy Jones’ Locker.” Pirates 4 brings nothing much new to the table, and the obvious setup for Pirates 5 elicited naught but groans from me. If you’re feeling up for a pirate adventure, do what I did when I returned home from the theater: just re-watch the first two and then pretend that 3 and 4 never happened. My favorite film of the summer, Super 8 charmed me from start to finish. The spiritual successor to movies like Hook, The Goonies, and Stand By Me (with splashes of E.T. and Close Encounters of the Third Kind tossed into the mix), J.J. Abrams’ Super 8 follows a group of kids in small town America who are trying to film their own horror movie. During a late-night shoot, the amateur filmmakers witness a horrible train crash, and then the kids fear for their safety as they realize their camera picked up something supernatural on film: something they were never meant to see. The kids are played by mostly unknown actors, and all give solid, believable performances. Super 8 has the perfect balance of comedy and suspense, and echoes of early Spielberg come through loud and clear. 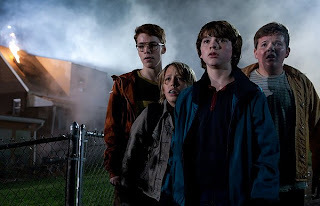 To me, summer movies are ultimately about fun, and Super 8 provided the most fun I’ve had in a theater in a long time. 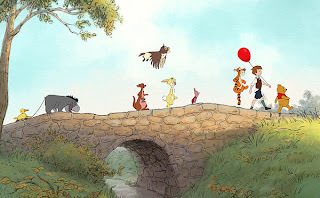 Winnie the Pooh is one of my favorite films of the year. Meant as a direct sequel to The Many Adventures of Winnie the Pooh (1977), this movie recaptures the magic of old, not only in its simple animation, but most importantly in its humor and charm. The stories were lifted from A.A. Milne’s literature, and the quirky jokes and classic characters are better than in any other Pooh film (or TV show) since the 1977 original. Voice acting hits very close to the original mark, and John Cleese was a great choice to replace Sebastian Cabot as narrator. Just as with the original Pooh books and films, children will enjoy Winnie the Pooh, but parents will enjoy it on an entirely different level. X-Men: First Class is the best in the series since X-Men 2, and despite its flaws, it offers more than enough to wash the taste of the last two movies (X-Men 3 and X-Men Origins: Wolverine) out of our mouths, proving that this franchise has more to offer. This origin story goes back to when Charles Xavier (who later becomes Professor X) and Erik Lehnsherr (who later becomes Magneto) first met and formed a lifelong friendship/rivalry. We learned in the first film that Erik was a Holocaust survivor, but that piece of his tortured past plays a more central role this time around. First Class features strong action and handles Xavier and Lehnsherr’s relationship with care, but a few sloppy plot pieces and underdeveloped characters keep this movie just shy of ranking with the greatest superhero fare.